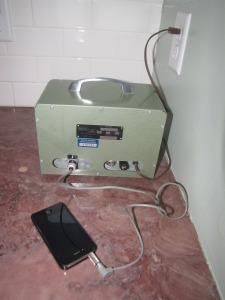 Shon recently retrofitted this 1950s era portable amplifier (Magnasync by Moviola) so that we can plug in our iPhones and enjoy whatever we’re streaming – for me it’s always one of three things: Pandora, Serial Podcast (which I’ve listened to all 12 and am anxiously waiting for the new show), and NPR news. 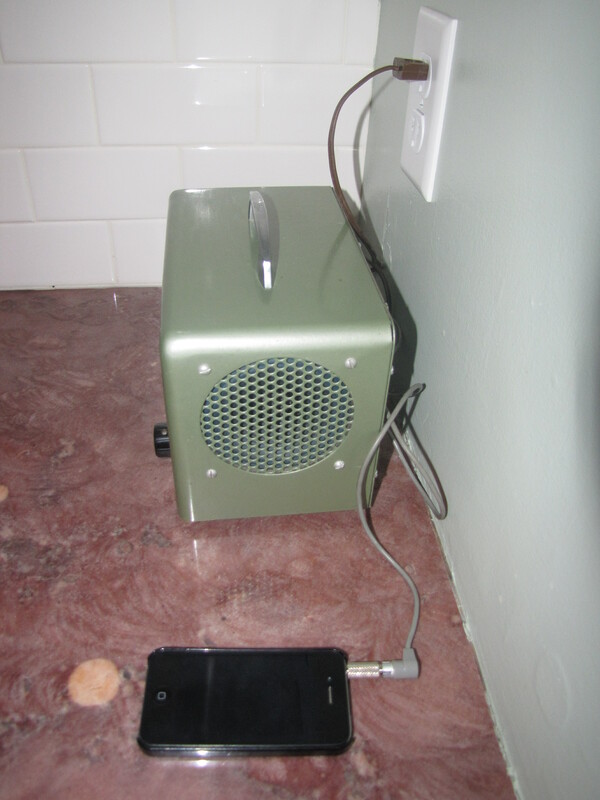 He found the amplifier a few years ago at a surplus auction for about $10. 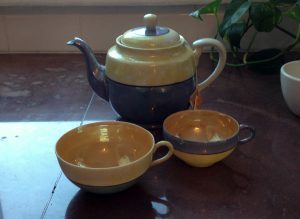 A little more than two months ago, I saw this lusterware tea set at a local thrift shop. I thought it was lovely, knew it was an antique, but, I didn’t purchase it because I didn’t need another tea set. I have two already. A few weeks later, I stopped into the shop while running some errands and I saw that the set was still sitting on the shelf. Again, I left it behind. Then, I noticed that one of my daughter, Parker’s favorite activities was having tea parties with me, her dolls and anyone else who would participate. I was reminded of this tea set and determined that if it was still at the shop I would buy it. As luck would have it, it was there when we visited a few days before Christmas. So, $20 later, it was mine. The set came complete with a sugar dish and cream pitcher and six cups, six saucers and six dessert plates. It is delightful. However, the fun that I’ve had with my daughter has been priceless. I pour a tiny bit of tea in her cup, then she pours cool water from the cream pitcher until it is cool enough to drink, and we sit and visit about our day as we sip tea. For me it’s much more fun than pretending with her doll size tea set – and I think it is for Parker as well. Since I’ve purchased it, I’ve been taking a pot of tea up with me each morning as I write. It has curbed my coffee habit a bit and provides warm comfort on these blustery, below zero, cold, cold days! P.S. I also love the color! They remind me of FFA official colors royal blue and corn gold as well as the colors of SDSU. While I was in D.C. this fall covering the National Farmers Union Fly-In for S.D. 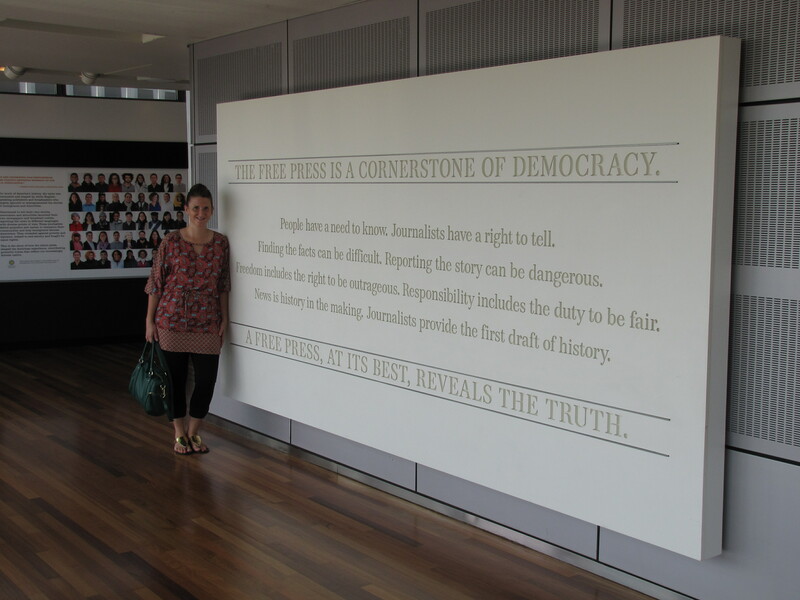 Farmers Union, I visited the Newseum. This wall plaque says it best. Following the tragic attacks on French journalists, I’m reminded of the power behind our First Amendment Rights.